Unlike other instances that I’ve looked at, where an English-sounding Thai word undoubtedly comes from an Anglo or European source — and I’d usually go with English — here I’d put my money on a non-Anglo origin: The Free Dictionary tracks the etymology of English ganja through Hindi to the Sanskrit word for hemp, and I’d guess that Thai กัญชา also has its origin in the Sanskrit. Which brings to mind บ้อง — a rare instance of English borrowing from Thai (at least according to TFD). I’m sure there’s some interesting history behind these borrowings! Special thanks to K. who kindly let me photograph her bag and gave some background info to boot. 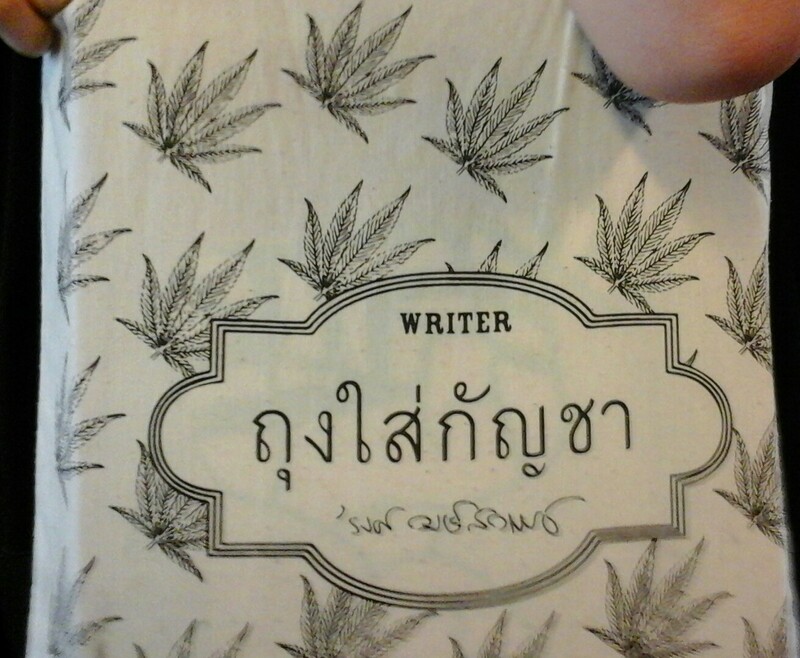 The scrawled signature is that of Thai writer รงค์ วงษ์สวรรค์ (Rong Wongsawan), and while I’m not sure whether anything of his has been translated into English, I did find this interesting article/obit, and this blog post with cool-groovy-funky visuals.